This question has always interested me. Early in my life, I had many thoughts about science. In fact, the only classes I really did well in during my prep-school years were in math and science. It is therefore not surprising that I went on to get degrees in biology. But I was never particularly swayed by my teachers that evolution was a process that worked. In fact, I was always a bit of a freethinker and since I couldn’t see a mechanism by which evolution could bring about life, I was always a skeptic. So, I was always left with the question in my mind, “how did life begin?” For many years, I put that thought on the back burner. Since my work was in applied mathematics, I seldom had to think about the whole process of evolution. Yet, I was often asked about my position regarding evolution. For that reason I did give it considerable thought. My scientific research involved trying to define processes for the mechanisms in the plant and animal kingdom. When it came to evolution, I could never determine a process by which the primordial organisms could become established. In other words, where did the information in DNA come from? Broadly speaking, theistic evolution is the belief that God used evolution as his means of producing the various forms of physical life on this planet, including human life. Theistic evolution teaches that while the various species emerged through the evolutionary process, God superintended the development of life. That is, evolution was the means that God used in bringing about the divine purpose of creating life on this planet. Theistic evolutionists generally maintain the classical Christian doctrines of creation, original sin, and human depravity in need of redemption. However, as we will see, this does not hold. This line of thinking is very similar to traditional evolution. The difference in theistic evolution is the inclusion of the idea that God started the whole process. The ordinary way of looking at theistic evolution is to say that a theistic God used an evolutionary process He created to produce all living species of life. In addition, theistic means that God performed at least one miracle after his original creation of the universe—He created life out of nothing. Other than this, there is no real difference between theism and deism on the matter of origins. The minimal theistic evolutionist believes that God performed two supernatural acts of creation. First, He created matter out of nothing. Second, He created the first life. After the creation of the first living organisms, God merely allowed evolution to take over. And all subsequent organisms emerged from this first living life. The maximal field theistic evolutionist believes that God performed at least three miracles. These miracles included the creation of matter, first life, and the human soul. After the initial creation of matter and life, all animal organisms evolved by natural laws God established from the very beginning. This is the traditional view of the Roman Catholic Church (at least for the past century or so). Deism itself does not believe in any miracles after the initial active of creation. God merely started the world in motion and then let it go on about its course. As far as the evolutionary process and the production of life forms is concerned there is no real difference between deistic evolution and naturalistic evolution (or Darwinian evolution). In my mind, theistic evolution is not very satisfying. All forms of theistic evolution hold to the same assumptions as atheism and agnosticism. That is to say, they deny supernatural creation by God. Only theism truly believes in the supernatural acts from God who is beyond the universe and who intervenes in it. It really makes no difference whether the natural processes were created by a theistic God or not, theistic evolution represents the idea that non-intelligent natural laws have the ability to bring new life forms into existence. I would like to give a basic list of objections to theistic evolution. My intent is not to discuss these, but merely to give you an idea of the problems that are associated with theistic evolution. It seems that the appeal of theistic evolution comes from the claim that it is the only viable model of origins. Many believe that theistic evolution is the only model that can withstand the scrutiny of modern scientific scholarship. Theistic evolution is believed because of the misguided belief that it provides some reconciliation between the general theory of evolution and Christianity. Theistic evolution, however, is a misconstrued theology designed to appeal to Christians who really want to appear respectable in the scientific forum of ideas. This brings makes the Bible a strange combination of myth and doubtful historical fact with very little authority and relevance. Liberals theistic evolution cannot be reconciled with Paul’s teaching that the history of Christ’s resurrection is related to Adam’s history. Even the more conservative theistic evolutionists fail to justify their position in view of serious contradictions between theistic evolution and doctrine central to Christianity. Specifically, theistic evolution denies the doctrine that sin is the cause of physical death (Gen 2:17; 3:19; Prov 21:16; Rom 5:12-14; 1 Cor 15:22, 56). The Bible clearly teaches that physical death is a direct result of the historical truth of the fall of man (1 Cor 15:22). Theistic evolution thereby destroys the basis of the doctrine of Christ’s substitutionary atonement and the redemption of sinners. Theistic evolution is based on the presumption that true man has evolved from apelike creatures who lived and died over millions of years. It presents Christ’s humanity is embedded in a genealogical scheme that includes early hominids, apes, and the first life forms. It limits God’s sovereign creative activity to naturalistic processes involving death, suffering, and decay. This is a travesty to Christianity, since death and suffering of the penalty for man’s sins against the holy God… Not God’s instrument of creation. Theistic evolution is clearly not compatible with Genesis, or the rest of the Bible. Ultimately, the big question in life is, “What will I do with Christ?”; it is not “Where did I come from?” No discussion about evolution can deny the evidence surrounding the resurrection of Jesus. This is where we need to take any argument regarding science in the Bible. The Bible and science are consistent, they are compatible, and they can be reconciled together. But this is not done through theistic evolution. 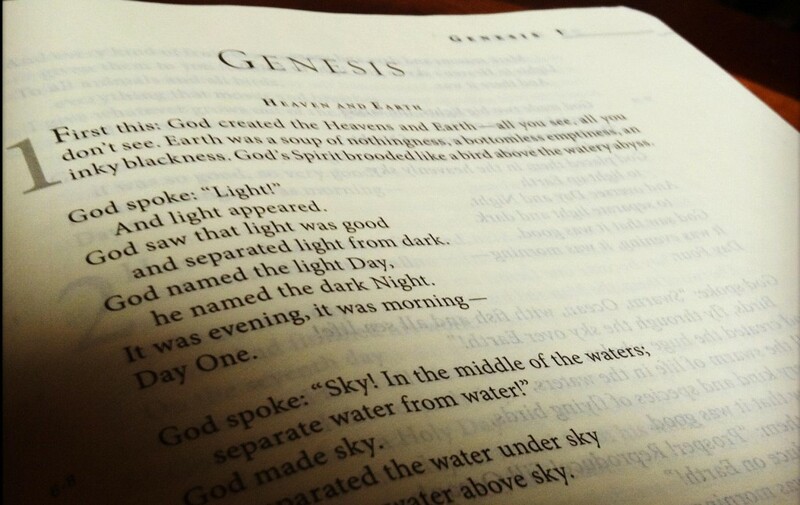 The creation narrative of Genesis is to be taken literally. God speaks of a definite order of events and He speaks of His creation is taking place in a fixed period of time. This disallows the idea of geological ages and supports a much younger earth. No Replies to "In The Beginning"